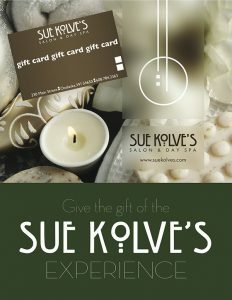 When it is time to relax and unwind, there is truly no place like Sue Kolve’s Day Spa. We have created a unique menu of signature experiences, treatments and products to bring our clients the very best services available. Whether a massage, facial, pedicure, body treatment or salon service, we invite you to escape and enjoy. The anti-aging restorative facial is designed using the finest organic ingredients combined with anti-oxidant algae complexes with a restorative blend of aromatherapy oils. It’s this mix of seaweed and botanical ingredients that helps to stimulate collagen production and reduce the appearance of fine lines and wrinkles. This facial results in instantly firmed and tightened skin with a natural and more radiant glow. This professional peel has been especially formulated to be as active as possible but in the gentlest formulation. Sometimes our skins needs are more than a gentle scrub can fulfill. Therefore using the powerful benefits of organic seaweed blended some of natures finest active ingredients, this peel will gently break down the impurities of the skin and remove dead skin cells. The skin is left relaxed, healthy, vibrant, and younger looking. The Signature Treatment includes our classic Spa Facial. This truly amazing detoxifying therapy uses real organic seaweed leaves to scrub and wrap your body. Beginning with a body buff, this treatment detoxifies firms and softens the skin and is excellent in conjunction with a weight loss program. The whole body is then covered in Laminaria Seaweed leaves for instant results. Includes organic bristle brush to take home ($34 value). A wonderful fragrant mix of lavender oil, seaweed & sugar. It has a double action of gently removing dead skin cells with sugar and healing with seaweed extracts and lavender essential oil. Submerge your body into a bath of organic, hand-harvested Atlantic seaweed to remove unwanted toxins and alleviate aches and pains. This bathing ritual is the simplest and purest of all organic treatments! Lazy Days utilizes the natural power of organic hand-harvested seaweed to deeply moisturize the skin, increase circulation and promote healing. It’s the renowned “Sailors Cure”. Includes organic seaweed product to take home and use again. Mindful Dreams is a relaxation treatment that offers luxury and comfort in an incomparable sleep encouraging experience. Incorporating specially designed soothing products alongside sleep inducing cultural massage and meditation techniques, this well being focused treatment evokes instant tranquility and fosters inner wellbeing, calmness and serenity. After a day well spent enjoying a round of golf, visit The Spa to discover the powers of this majestic ocean. Encapsulated in our exclusive head to toe ritual are the renowned benefits of seaweed, from the powerful Algal protein which helps to ease muscle stress to the multiple vitamins and minerals which help to revitalize the body. Ideal for sore, aching muscles, or purely just an indulgent treatment to end an incredible day. To recharge circulation of the lower limbs and refine your skin you will first enjoy a Sea Salt Scrub exfoliation from the knees down. Then a deeply relaxing massage of the lower legs after which your legs are wrapped in warmed Atlantic seaweed leaves to detoxify, increase circulation and nourish tired feet and legs. To nourish, recondition and refine your hands you will first enjoy a Time to Shine exfoliation from the hand to elbow. Then a deeply relaxing massage of the hand and arm after which your hands are wrapped in warmed Atlantic seaweed leafs to hydrate, increase circulation and nourish dry hands. Balayage is a freehand technique in which swatches of hair are sectioned and color is hand painted to give hair that perfectly natural, softer looking dimension. This deluxe package includes Redken’s pH Bonder Treatment, a unique synergistic system that helps protect bonds during technical services to keep fibers strong and is finished with a Glaze Treatment to smooth the hair cuticle, amplify shine and enhance softness. From natural-looking very light blonde to creating personalized hues of rich, gorgeous color that add depth. Our meticulous experts master any shade with the utmost respect for protecting the integrity of the hair. This service includes Redken’s pH Bonder Treatment, a unique synergistic system that helps protect bonds during lightning and restores the hair fiber for improved strength and shine. Let us help you get ready for that special event. This customized service begins with a consultation and shampoo with our famous scalp massage. It includes the Redken HeatCure Treatment to protect hair and seal in shine, a blowout style, makeup application and false lashes. It’s the complete package. This treatment is tailored specially to the Mom to Be and her growing bump. The bump is enveloped in a specialized mask helping to support connective tissue and prevent stretch marks. Your feet will be wrapped in 100% organic Laminaria Digitata Seaweed leaves to help boost circulation, improve lymphatic drainage, and reduce fluid retention. The hydrating organic masks work their magic while Mom enjoys a beautifully relaxing face, hand, and arm massage. This is the perfect rejuvenating treatment to support the wonderful journey to motherhood. This organic wellbeing ritual promotes relaxation and a sense of tranquility while deeply hydrating and nourishing your skin. A full body exfoliation will gently buff the skin, leaving you feeling radiant and renewed. Nourishing Mama Oil is used to gently ease stress and tension with a top to toe body, face and scalp massage. Melt away the aches and pains associated with pregnancy and feel comfortably cocooned, supported and restored. to start earning points that can be redeemed towards future product purchases! Sue Kolve’s Salon & Day Spa is a place where clients are treated with genuine warmth, a place where they can relax and feel good about themselves. Copyright © 2019 Sue Kolves Salon & Day Spa. All rights reserved. Salon Web Design by StyleNet.